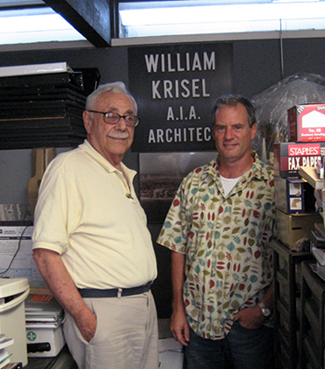 We had the honor of meeting with William Krisel, the architect of the Racquet Club Road Estates, on September 9, 2006. We spoke for two hours at his Brentwood home that he designed and built in 1955. It was easy to discern the distinctive Krisel elements that influenced the Alexander houses a few years later: space-age kitchen cabinets, beamed tongue and groove ceilings with clerestories, exterior wood screens, a courtyard between the open carport and house, and interesting indoor/outdoor relationships. In fact, Bill said that George and Robert Alexander requested elements from his house be included in their developments. Bill was partnered with Dan Palmer then, but Palmer didn't work on the Palm Springs or San Diego developments; he concentrated on other regions . The sudden death of the Alexanders and their wives in a plane crash on November 14, 1965 curtailed much of Bill's work including a renovation of the Palm Springs Racquet Club which the Alexanders owned at the time. By the mid-1960's Bill stopped designing single family homes and concentrated on high-rises. Bill was generous enough to allow us to include his original floorplans and elevations on the website. They are displayed below along with the real estate agent's original flyer for the development. There are notable omissions in the built houses compared to the original designs which Bill says was done to keep the homes affordable. Overhangs were eliminated and clerestories in the rear elevation were deleted. Flat roofs lost all their clerestories and gable models lost the floor to ceiling bedroom windows and full width gable glass. When renovating, these original drawings should be helpful in keeping our houses stylistically accurate. Bill is clearly peeved by alterations to the houses that aren't sensitive to the original design. These include randomly punched windows, filled-in courtyards, enclosed carports, and the interruption of indoor/outdoor components such as the entry fence projecting into the kitchen. Since there seem to be no color photos of the houses when new, we asked what the original colors were. He showed us the original color schedule that specified the paint for each element of each house which was varied throughout the development. Unfortunately, the color references are from the O'Brien paint company which no longer exists. We do know of a vintage catalog that has been found, so we hope to track down this mystery soon. One consistency was that the ceiling beams in each house were always painted Weathered Brown, just as they are in Bill's house today. We thank Bill Krisel for his time and hope to continue a close relationship in our effort to preserve our historic neighborhood.